As you probably know, it's much easier to sell things to existing customers than to brand new prospects. Once your business is established, many of your customers will buy from you time and time again. This is why it's so important to build your own customer email list so you can keep in touch with your customers, tell them about new products and offer them special deals. Although it's possible to build a customer email list by manually adding the details of every customer when they buy from you, it can be very time consuming. 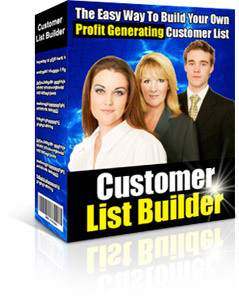 Customer List Builder is a brand new, simple tool which will automatically build your customer email list for you. This special software works in conjunction with the popular Paypal payment system, directly capturing the details of all orders through a special Paypal feature called "IPN". All you need is an autoresponder which accepts subscription by email (which most do) and this software will automatically subscribe every customer to your autoresponder for you. Once they're subscribed, you can use the standard features of your autoresponder to send them emails whenever you want. As you can see from the screenshot above, Customer List Builder is very easy to use. Just fill in the email address for your autoresponder and click Create Script and the software will instantly generate a complete PHP script file. Just upload this to your website using your normal FTP software (no special setup or knowledge is needed - just upload it in the same way as any normal web page). Once this is done, go to your Paypal account and enter the web address of the script file you just uploaded into the "IPN" entry in your Paypal Profile (there's full instructions and detailed screen shots to guide you through this simple process). Now, every time you receive an order through Paypal, Paypal's servers will notify your specially generated script automatically. The script will automatically get the name and email address information from Paypal and then automatically subscribe the person to your autoresponder. This simple system will add every single customer directly to your autoresponder as soon as they pay, with zero effort from you and no inconvenience to your customers. Building your own customer list just doesn't get any easier than this! Your copy of Customer List Builder comes complete with a special exclusive order record script add-on module. This special script automatically keeps a record of every order you receive, providing a complete searchable database of all your orders. For each order, the script will store the buyers name, company name, address, country, email address, order date, item name, payment amount, Paypal fee, Paypal transaction ID, Paypal buyer ID and (optionally) any notes you wish to add yourself. Every time you receive an order from Paypal, the order is automatically added to the database, with all the information automatically retrieved from Paypal. You can also add orders to the database manually if you wish. The database can be searched at any time for information on past orders, using any of the following criteria: buyer name, company name, country, email address, item name, notes and order date (either a single date or a range of dates). This powerful search feature means you can easily access your data for a wide range of purposes, from checking on a single order to compiling complete order statistics. If you'd like to see a demonstration of the script, click here (opens in a new browser window). This is fully functional, allowing you to create and search order records, but unfortunately it's not possible to demonstrate the automatic capture of orders from Paypal. Keeping records of your orders is essential for any serious business. This special script provides a superb fully searchable resource and it could save you so much time by capturing the order details directly from Paypal, with zero effort from you. You could pay a lot for such an easy to use and powerful system as this, but it's yours at no extra cost, with your copy of Customer List Builder. Building your own customer list can make a huge difference to your profits. This simple software will build your list automatically, saving you all the hassle, time and effort normally involved in building this very important list. Considering what an amazingly easy solution this is, I'm sure you'll agree that this software is a real bargain at just $19.97. Remember that this price also includes the powerful order record script bonus. However, despite the amazingly low price of this software, I know you may still have a few lingering doubts as to whether this software will really work for you. If at any time within the next 30 days, you decide that this software doesn't meet your needs, just send me a quick email and I guarantee to refund your money in full, no questions asked. I cannot promise how long I will continue offering this software at such a low price. The price could go up at any time without notice, so please order now to avoid disappointment. 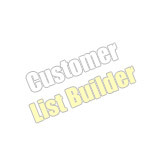 Customer List Builder is for use on PCs running Microsoft Windows. The script generated by the software requires a web host which supports PHP (almost all paid for web hosts now support PHP). The order record script add-on module also requires web host support for SQL (most but not all web hosts support SQL). Installing the add-on module requires a little technical knowledge but comes complete with detailed instructions and videos. Note that the order record script is an optional add-on and the software can be used without this module to simply build a customer list automatically. Your autoresponder must accept subscription by email in order to use the customer list building feature. Almost all autoresponder services and many scripts provide this facility.